It’s been a terribly long time since I’ve made a post here. I apologize for disappearing like that. I have been very, very busy with lots of different projects. I’ll work on adding more posts about my artistic endeavours of the last year soon! I have been working on some new art recently, and I’ll be making a new Hallowe’en art piece this year that features Aena from my comic Green Corner dressed as Lucy Ricardo in I Love Lucy. 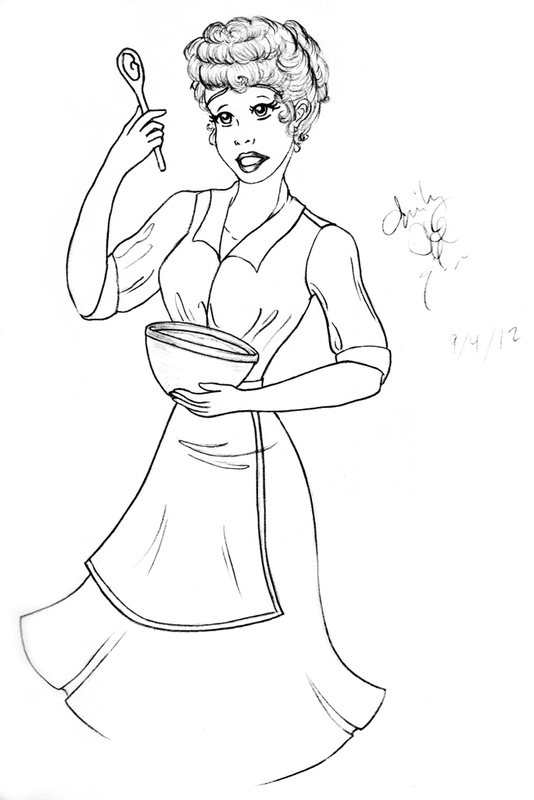 I think Lucille Ball’s hairstyle at the time of I Love Lucy is a little tricky to draw in this style, and may require more careful shading than normal. Linework took me 1 hour, 24 minutes in Illustrator CS3. It was the first chance I had to draw with my new Intuos 5 pen tablet, so I’m still getting used to that (I previously used a Graphire 3). Not a lot of changes between pencil and linework this time, although I did try to even up the hair a little. There will obviously be more added to this to make it more Hallowe’en themed. I think I will need to keep Aena’s hair pink for this one, since doing a natural colour will make it look like it is only fanart. I’ll be using a colour palette more along the lines of the Red Riding Hood piece I did a few years ago, and adding a few typically Hallowe’en elements like spiders and webs. I looked at a few different pictures of Lucille Ball to get a sense of the clothing style and hairstyle that would be appropriate. The pose is loosely based on one picture I found of her. I haven’t decided yet on the artwork for my winter holiday cards this year. I didn’t send out any last year, so I really want to do something special this time to make up for it. I’m hoping to do something with letterpress this year, since I’m in a book arts guild and have really wanted to start hand-setting type and doing my own letterpress printing! I hope to be making more posts on here now, and I hope you enjoy this one! I will have another sketch up soon that I did recently as well for some more art that you can take a look at. Amazing work, and great to see your process too! Can't wait to see the new Winter holiday cards design! You've done a great job, and it's really interesting to read more about how you do your line work. Usually I don't understand artist's jargon but you made this really accessible!